This is my staple bone broth! The one I usually have on hand at all times since it is so versatile and neutral in flavor I can add this to many recipes, like my Apple Cider Bone Broth or even as a dressing in my Greek Salad. There are a couple ways I like to make this. My most favorite is by first making my oven roasted chicken and then using the carcass in the broth as it adds a tremendous amount of flavor. The other way is just to take the entire chicken (thawed or frozen) and throw it into a slow cooker or large pot, add your fix-ins, fill with water, and cook on low for about 24-42 hours. In a few hours, you can remove the meat from the bone and use that in your recipes throughout the week then return the carcass to the pot for the remainder of time. Either way will yield a delicious, nutrient dense and nourishing broth! Bone Broth Cooking Demo Part 1: Here, I discuss the types of bones to use in a nourishing broth and the health benefits of each so that you can determine the right broth for you. 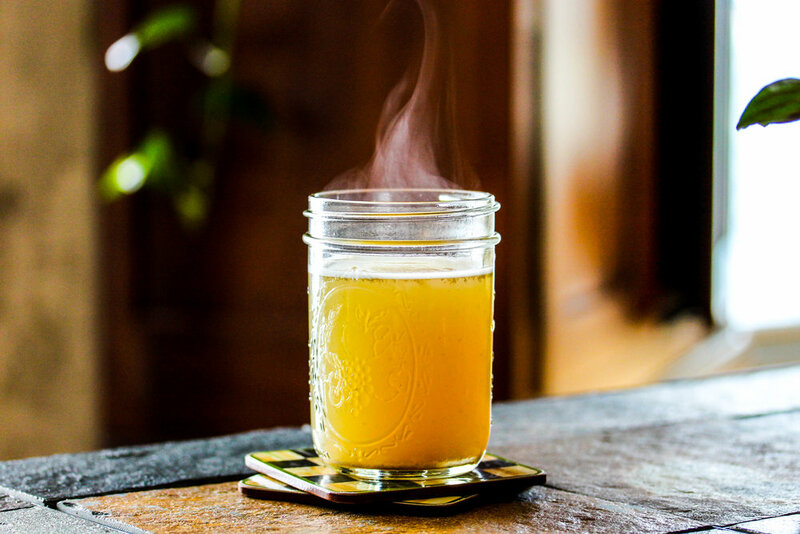 Bone Broth Cooking Demo Part 2: Discover how to make a nourishing and nutrient-dense bone broth with my simple 4-step process. Add all ingredients to slow cooker and fill with filtered water about 2-inches from top. Cook on low for 24-42 hours, stirring occasionally. Strain and store in air-tight containers or Mason jars. Generally stays fresh for about a week or frozen for a year. You can also freeze in ice cube trays and pop a few whenever you need!